The Aquascape UltraKlear® UV Clarifier effectively clears unsightly green water algae blooms. Its technologically-advanced UV bulb maximizes the performance of the clarifier, while the narrow contact chamber increases its effectiveness significantly. The UltraKlears internal swirl sleeve optimizes UV clarification by increasing the contact time between the algae and UV bulb, increasing UV efficiency up to 50% over traditional UV clarifiers. An on/off indicator provides quick verification of bulb functionality and the electronic ballast ensures optimum wattage and bulb output. The Mechanical safety switch automatically turns bulb off when the ballast is removed. Using the included mounting brackets, the UltraKlear is able to be mounted either vertically or horizontally, and the easy-to-remove bulb and quartz sleeve make maintenance simple. Each UltraKlear UV Clarifier carries a 3-Year Limited warranty. The Aquascape UltraKlear® Pond UV Clarifier effectively clears unsightly green water algae blooms. Its technologically-advanced UV bulb maximizes the performance of the clarifier, while the narrow contact chamber increases its effectiveness significantly. The UltraKlears internal swirl sleeve optimizes UV clarification by increasing the contact time between the algae and pond UV light, increasing UV efficiency up to 50% over traditional pond UV clarifiers. An on/off indicator provides quick verification of bulb functionality and the electronic ballast ensures optimum wattage and bulb output. The Mechanical safety switch automatically turns bulb off when the ballast is removed. 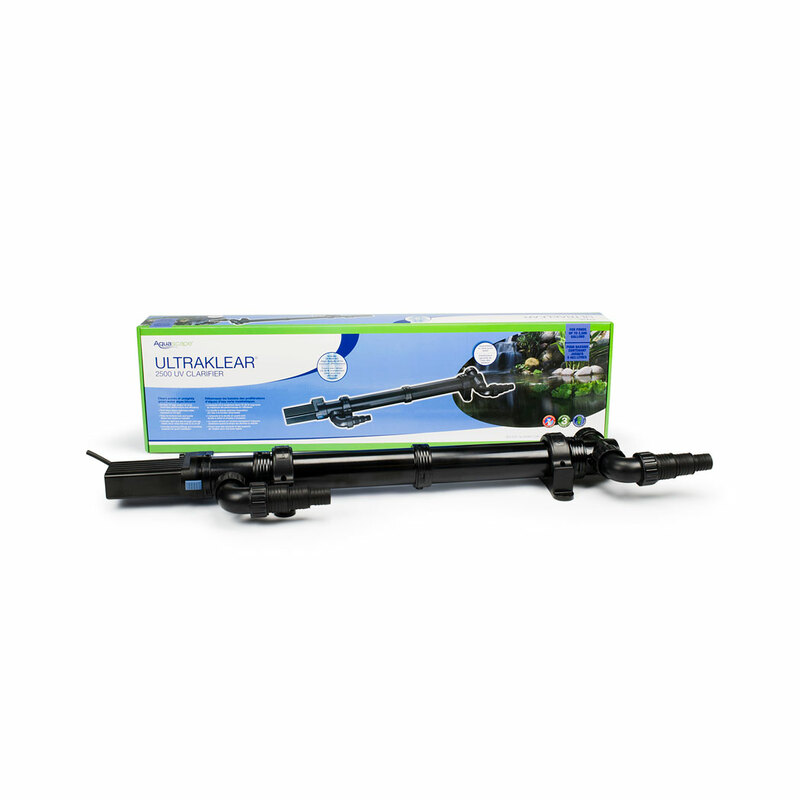 Using the included mounting brackets, the UltraKlear Pond UV Clarifier is able to be mounted either vertically or horizontally, and the easy-to-remove bulb and quartz sleeve make maintenance simple. Each UltraKlear UV Clarifier carries a 3-Year Limited warranty.